The American Academy of Healthcare Interior Designers believes that interior spaces within healthcare centers can have an impact on the health and safety of those patients, families, and employees who use them. We couldn’t agree more. Interior designers for hospitals have to think of everything from aesthetics like pictures and color schemes to functionality like sturdy chairs and clean surfaces. We think these professionals are pretty wonderful and hope that the next time you are in a medical facility that you think so, too. Curtain-Tracks can help healthcare interior designers with a few of the tasks they are charged with completing. First, our privacy cubicle curtains are pretty and functional. They come in a wide variety of colors and textures that will compliment just about any interior design. We know that public buildings must meet fire codes that don’t allow curtains to hang within 20 inches of the ceiling, so we offer curtains to meet these codes. They are flame retardant and come in 11 different color choices for the mesh that hangs between the curtains and the ceiling. 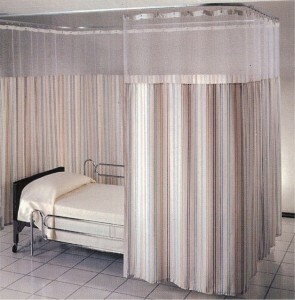 These curtains make for a very durable choice for the daily grind of hospitals. We carry an entire line of antimicrobial curtains that make perfect sense for emergency rooms or infectious disease centers because they inhibit the growth of bacteria. They can be machine washed or dry cleaned, and have superior stain and odor release properties. If interior designers are on a tight timeline, we even have curtains ready to ship immediately; just check out our quickship curtains that are always on hand in the colors oatmeal and cork. The curtain track really should be the star of the show but it’s often forgotten… which, ironically means that it is doing it’s job really well. It is barely noticed, until it is not working. Not working is simply not an option for hospital interior designers, which is why our privacy cubicle curtain track is one of our best sellers. It’s simple, pretty, and most importantly, it works, smoothly, every time. Especially in a hospital, the track must be reliable and sturdy. Those are two great words for this track. In addition, it can be bent into 45 or 90 degree angles to create a private area around a hospital bed. Please consider this post our thank you to the healthcare interior designers who think of everything. Also, consider this our contribution to their hard work. Check out our support page for answers to some frequently asked questions about your design, and then contact us to place an order for a really well designed hospital room.